At The Ocean Conference, close to 1,400 voluntary commitments for concrete action to advance implementation of SDG 14 were made by governments, the United Nations system, civil society organizations, academia, the scientific community, and the private sector. The Third International Conference on Small Island Developing States (SIDS Conference) was held from 1 to 4 September 2014 in Apia, Samoa. Around 300 Small Island Developing States (SIDS) partnerships were announced towards and during the Conference. Decent Jobs for Youth is a unique multi-stakeholder platform to address fragmentation and catalyse effective, innovative and evidence-based action at country and regional levels. With the commitment of its partners, Decent Jobs for Youth helps to scale up action and impact, driving positive change for young women and men across the world. SIDS Partnership Framework is designed to monitor progress of existing, and stimulate the launch of new, genuine and durable partnerships for the sustainable development of SIDS. Held in the margins of the High-level Political Forum on Sustainable Development in New York, the Partnership Exchange is United Nations annual global gathering for reviewing the work of multi-stakeholder partnerships and voluntary commitments in driving implementation of the Sustainable Development Goals. Next session will take place on July 2019 (date tbc). 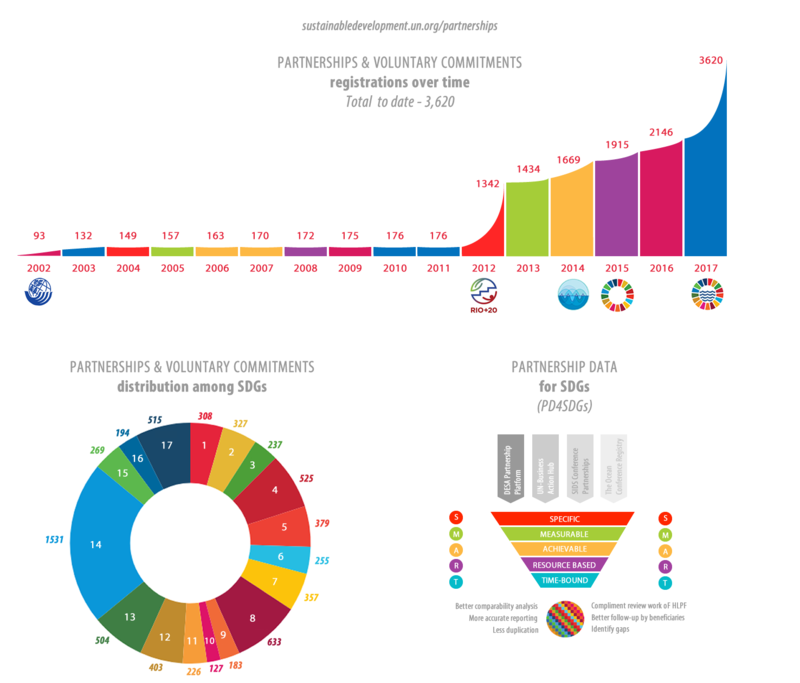 The Partnership Data for SDGs (PD4SDGs) initiatives has been developed to improve the transparency, coherency and accountability of multi-stakeholder partnerships and voluntary commitments.